Get more useable power and throttle response out our your BMW E36/E46/E39 with these Rogue Engineering Power Pulleys. The engine is the heart and soul of your BMW, pouring out its power at a seconds notice. However you may not be getting all the power you are promised by the dealership. Accessories such as the A/C compressor, alternator, power steering pump and water pump hinder your BMW's useable power. There is no way of getting around this, however Rogue Engineering has designed these Power Pulleys to make this system more efficient, by reducing drag on specific pulleys while allowing others to remain at their same efficiency. Rogue Engineering's Power Pulley kit give you more useable power and throttle response. 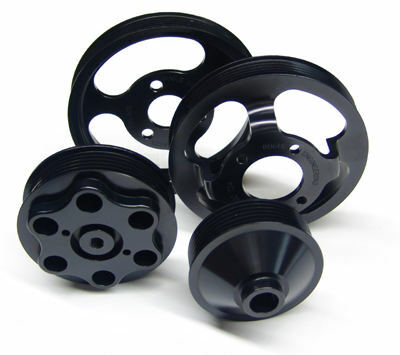 Rogue Engineering Power Pulleys are machined from 6061-T6 heat treated aluminum and specially coated with a MIL-A-8625 Type III hard coat anodize finish. The hard coat anodize finish actually builds a small surface layer on top of the aluminum, preventing wear. Each Rogue Engineering Power Pulley kit comes complete with installation manual and high quality replacement serpentine belt. US models only. Does not apply to European models. E36 328 models require last 7 digits of VIN in order to supply the correct power steering pulley. Include VIN at time of checkout. Any power pulley kit which includes a replacement crank shaft pulley allow for the factory harmonic balancer to remain in place. E39 M5 tensioner pulley requires minor modification of the factory tensioner bracket for installation. E39 M5 pulley kit also includes replacement A/C belt. Includes both A/C and serpentine belts. E46 M3 RACE pulley kit includes underdriven alternator and crank pulley. This pulley kit is STRICTLY for dedicated track/race cars (not cars that see street duty). A/C is no longer used. This is the same kit used on the 2007 Grand-Am GS Championship Automatic Racing M3s. The crank pulley has been designed to accept a dry-sump cog. The STREET and RACE kit use the same size belt. E9X M3 pulley kit includes replacement power steering pulley for 08 DCT and all 09 (6-spd and DCT). 08 6-spd models do not require replacement power steering pulley. Because of our unique pulley system, all of our E9X M3 pulley kit uses commonly available replacement aftermarket belts. If you have an NAPA, AutoZone or Pep Boys near you, that means you can have replacement belts immediately! No emergency weekend calls, no overnight shipping, no outrageous pricing for a custom-made belt!